Even though coconut is a tropical fruit, Eastern Europeans love it and use it generously in desserts, salads, and even soups. 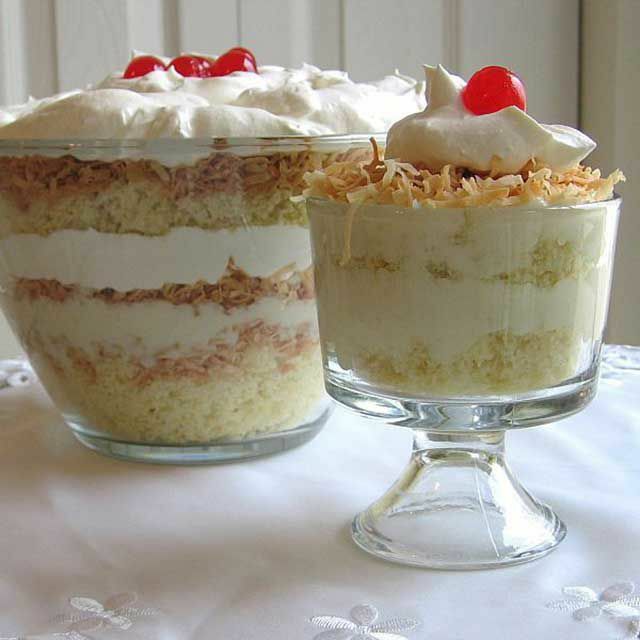 This dessert trifle combines vanilla sponge cake with coconut cream, toasted coconut, and whipped cream. Assemble it in a see-through glass bowl or trifle dish so the pretty layers are evident. Use seasonal fruits and fresh mint for garnish, such as mandarin oranges for fall or maraschino cherries for Christmas. Note: while there are multiple steps to this recipe, this trifle dish is broken down into workable categories to help you better plan for preparation and baking. Stir cornstarch, water, and vanilla in a small bowl to dissolve the cornstarch. In a heavy medium saucepan, bring 1 1/4 cups whipping cream, 1/2 cup sugar and butter to a boil. Add cornstarch mixture and return to a boil. Remove from heat and stir in 2 1/4 cups coconut. Cover with plastic wrap touching the surface of the cream and refrigerate for at least 2 hours. Crumble cooled sponge cake and layer half the sponge cake crumbs in the bottom of a trifle bowl. Pour on half the coconut custard cream followed by half the toasted coconut and a third of the whipped cream. Repeat ending with the last third of whipped cream on top. Sunny Lemon Cake - Recipe From "Piece of Cake!" Drunken Babka, Because Why Should Fruitcake Have All The Fun?